Peter Pomerantsev, Nothing is True and Everything is Possible: The Surreal Heart of the New Russia. New York: Public Affairs, 2014. 256 pages. 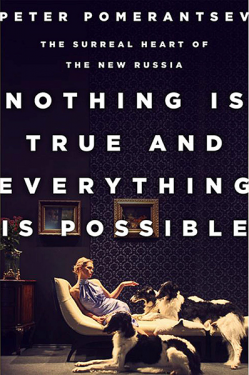 Pomerantsev’s first book, 2014’s Nothing is True and Everything is Possible, is, on the surface, a collection of stories showing the utter weirdness of Vladimir Putin’s Russia. Beautiful young women take classes on a reality TV show to help them lure oligarch husbands. A businesswoman framed on ludicrous grounds and then strangely acquitted leaves you wondering if this was unexpected justice or whether she had played an unwitting part in some larger, hidden, game. There’s a crime boss explaining his rise from local thug, an activist trying to save heritage buildings from developments funded by the crime bosses, self-improvement groups that veer into extortionist spiritualist cults infiltrating the elite, and the sheer strangeness of living in a superficially Western capital city where you can be stopped and thrown in jail if, when leaving McDonald’s, you don’t have the right identity papers. Q: Is it true that there is freedom of speech in the Soviet Union, just like in the USA? A: Yes! In the USA, you can stand in front of the White House and yell “Down with Reagan!”, and you will not be punished. Equally, you can stand in Red Square and yell “Down with Reagan!”, and you will not be punished. In the twenty-first century the techniques of the political technologists have become centralized and systematized, coordinated out of the office of the presidential administration, where Surkov would sit behind a desk on which were phones bearing the names of all the “independent” party leaders, calling and directing them at any moment, day or night. The brilliance of this new type of authoritarianism is that instead of simply oppressing opposition, as had been the case with twentieth-century strains, it climbs inside all ideologies and movements, exploiting and rendering them absurd. One moment Surkov would fund civic forums and human rights NGOs, the next he would quietly support nationalist movements that accuse the NGOs of being tools of the West. With a flourish he sponsored lavish arts festivals for the most provocative modern artists in Moscow, then supported Orthodox fundamentalists, dressed all in black and carrying crosses, who in turn attacked the modern art exhibitions. The Kremlin’s idea is to own all forms of political discourse, to not let any independent movements develop outside of its walls. Surkov has served in a dizzying number of positions and professions, including deputy prime minister, but he is the first to acknowledge that titles are not important. Only power matters. Functionaries are used to holding real power: it’s worth remembering that the most powerful person in the Soviet Union wasn’t the president or the prime minister but the general secretary of the Politburo. Elections have never mattered very much: the Tsar’s courtiers were replaced by the Soviet apparatchiki. Now the political technologist is the dominant species, wielding influence behind the scenes but, in an evolution, proud to show off that power in public. 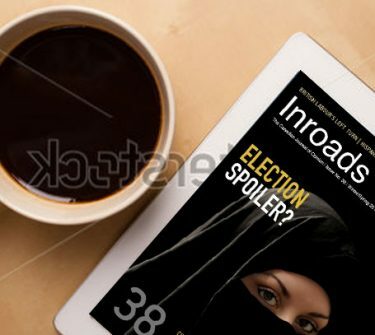 Spin doctors, pollsters, opposition researchers – the armies of professional political staff who support parties and leaders in established democracies – know that their first priority to is to stay in the background. For example, Canadian conservative David Frum’s influence over President George W. Bush began to drop when he claimed authorship for the President’s infamous “Axis of Evil” speech, making him the story instead of his boss. Spin doctors have influence, but it is limited. Most Westerners react sharply and negatively to the perception that institutions are being mobilized behind any government. Western public services and the media are clearly contested ground, with objective ideals confronting political realities that encourage favouritism and patronage under the best conditions. There are obvious ties between the leaders of governments and business in Western countries that are, again, somewhat inevitable: people running things, whether large businesses or large government departments, tend to hang out together. Western political movements fight against that collusion. You will hear arguments around immigration, tax policy, the death penalty and climate change, but no serious political party or group pushes to relax the rules around political accountability or corruption. Campaigns in the established democracies remain a competition to see who can advocate for the clearest, most open, government. In countries without a history of the rule of law, personal freedom or the understanding that government can serve more than just itself, the idea that the machinery of government could be separated from the party in power is ludicrous. You should expect that every civil servant would obey political bosses, and that every businessperson would be expected to do the same. This difference is profound: in authoritarian countries like Russia, new political movements advocate increasing central control. Democratic reformers are scorned and weak. There are other differences. The West does not have, and would not tolerate, armies of psychologists, sociologists, historians and scientists trained to advance political as well as scientific arguments, and to put obedience to a political orthodoxy ahead of any professional ethics. That was the Soviet reality. To survive, Soviet citizens had to be shape shifters, advancing “correct” positions that could change overnight, on the whim of the party. If you made a mistake your life could be over. Surkov and his ilk, who lived through the hollowing out and then collapse of Soviet power, had to confront the failure of that system and the subsequent disillusionment with democracy that marked the turmoil of the 1990s and the rise of the oligarchs. They noticed that the underlying culture, of power divorced from reality, endured. Functionaries trained to destroy the market became billionaires, while majors who had trained to physically destroy democracies became, if not democratic politicians, at least elected ones. What remained? A country that remains centralized and corrupt, a terror-wielding security service that persists and a government that focuses on strengthening nationalism over delivering public services. What changed? The adoption of a new set of ideas that turned out to be much more effective than Communism or Tsarism. If Soviet authoritarianism forced everyone to express a single opinion, even if that opinion was opposite to the one they had been forced to express yesterday, postmodern authoritarianism says no opinion matters. You can believe something, or nothing. You can believe things that are clearly completely contradictory. All that matters is the government remaining in power. Pomerantsev’s book is filled with images of flight, escape, of freedom and butterflies transforming. When Surkov is asked about the travel restrictions imposed on him by Western sanctions, keeping him from directly experiencing the Western culture he clearly loves, he points to his own head. He says that what he needs of the West he carries inside him, displaying a skill Soviet citizens quickly developed: the ability to have an inner life divorced from your actual life. When you’re politically malnourished, when information is filtered and thinned and contrasting flavours evened out, you compensate. You try to create a better world in your own head. Governments like this don’t just shape the information you’re allowed to see or hear – they want to influence how you react to that information. And not just the way you react externally – censoring what you say, reporting people who speak against the government – but internally, changing the way you think, altering the way you judge risks and rewards or open yourself to the potential dangers of genuinely trusting friendships. Nations used to being spied on cannot be condemned for developing unhealthy levels of paranoia, suspicion and even fatalism: it’s a natural protective mechanism to help make life bearable. This is the inner world of Winston Smith in 1984, or Terry Gilliam’s 1985 movie Brazil, or countless other tales from or about dystopias and tyrannies. Hundreds of writers have focused on the authoritarian side of the Russian coin, placing Putin and his regime on a left-right, ideological-to-pragmatic, modernizer-to-traditionalist continuum. Since he comes from the world of entertainment Pomerantsev’s contribution is to wander, almost accidentally, into a confrontation with the intentionally surreal heart of the country and its government. The Russian government has scientific expertise and political thinking linking behavioural science to public opinion research to the design and launch of political and social movements designed to serve the needs of Putin’s government. They include biker gangs, groups of scientists, religious figures from the mainstream to the bizarre fringe and political parties by the dozen, from Communists to fascists to supposed reformers. Sometimes activists are arrested, sometimes they receive Putin’s approval, sometimes that approval is withdrawn. Sometimes they are shot. No one can say, with any certainty, what is going on. Surkov’s Russia offers a new sort of new deal in the face of this manufactured chaos: in exchange for tolerating the regime you can believe anything you want. You can say just about anything you want, not because the government believes in free speech but because your expressing your fantastical opinions, combined with countless others’ expressing theirs, helps create an ever-larger billowing cloud of political fog so dense that the state, hidden within, can do whatever it wants. The Russian propaganda machine has evolved from the blunt and unconvincing “America is bad, democracy is a sham” lines of the Soviet era. Everyone, including the propagandists, knew they wanted the blue jeans, rock music and creature comforts common in the West and nearly unattainable in the East. Surkov’s Russia lets you enjoy those luxuries, and crave more, while simultaneously believing your country, with its diminishing life expectancy and crippling debt, is superior in all ways to the West. The Soviets tried to restrict thought and access to property in pursuit of maintaining control of their country. Today’s Russia lets you think what you want and own what you want in pursuit of maintaining that control. Same people, different policy tools. The unparalleled freedom and prosperity of the postwar West spawned, as every society does, dissidents. A culture based on the idea, if not always the reality, of allowing nearly unfettered speech and new ideas quickly generated philosophies that challenged liberal capitalist democracy. Postmodernism, in just a few decades, has upended Western culture. For hundreds of years Enlightenment values that exalted reason and the scientific method were the engine of social change: critical thinking went from dangerous treachery to an essential tool that drives the development of modern societies. A culture that had colonized much of the world partly on the basis of a sense of its own superiority, driven by undeniably stronger institutions and technology, quickly snapped inward, confidence replaced with an often crippling self-doubt and loss of common purpose. Postmodernism says there are no roots and no facts, and that empiricism itself is a power structure designed to sustain its own privileged position. It has no claim to superiority. That postmodernism itself has to be exempted from this cycle of self-criticism (if there are no facts why pay attention to postmodernism?) is ironic but beside the point. For Western governments that rest on an ideal of democratic accountability the postmodern critique – underneath the ideal is the same naked aggression and desire to control – is devastating. There is nothing good here, just people protecting themselves and their friends, excluding those different from themselves. For authoritarians, this is a fantastic gospel to adopt: the philosophers of the liberal states are the ones ready to expose their hosts as charlatans. Today, the best way to be Western is to condemn the West. Free speech, free thought: these are just illusions. In contrast to the intersectional confusion of the West, Putin’s Russia looks more honest, more genuine. Russians are free to believe what they like, vote for whom they like, buy what they like. And those freedoms rest in the arms of a strong government, a government that is authentic. There is only one fact that matters in Russia: Vladimir Putin is President. Everything else is negotiable, debatable and ultimately irrelevant. Who can say if it was the Russian government that bombed apartment buildings and then claimed the attacks came from Chechen rebels, giving a pretext to the second Chechen War? Who can say if the Nord-Ost crisis in 2002, when security forces killed around 200 hostages by accident when liberating them from a Moscow theatre, was covered up by the authorities? Large crimes mix with small absurdities. The title of Pomerantsev’s book is humorous but ultimately profound, superficially surreal but ultimately a concrete state policy: nothing is real and everything is possible. A radical doctrine supposed to destroy establishments has been turned by Putin into an establishment weapon. Hopefully postmodernism’s host countries will soon notice that these ideas are incompatible with democracy and an open society. If not, they may soon adapt again, and further undermine already weak democracies. As Donald Trump has shown, strong men spouting nonsense are not a specifically Russian weakness. Our institutional defences are stronger than Russia’s, but they are not insurmountable.